Stir all the ingredients together in a big bowl (I added the pretzels last), then spread out on cookie sheets and bake at 200 degrees for 2 hours. THE END. 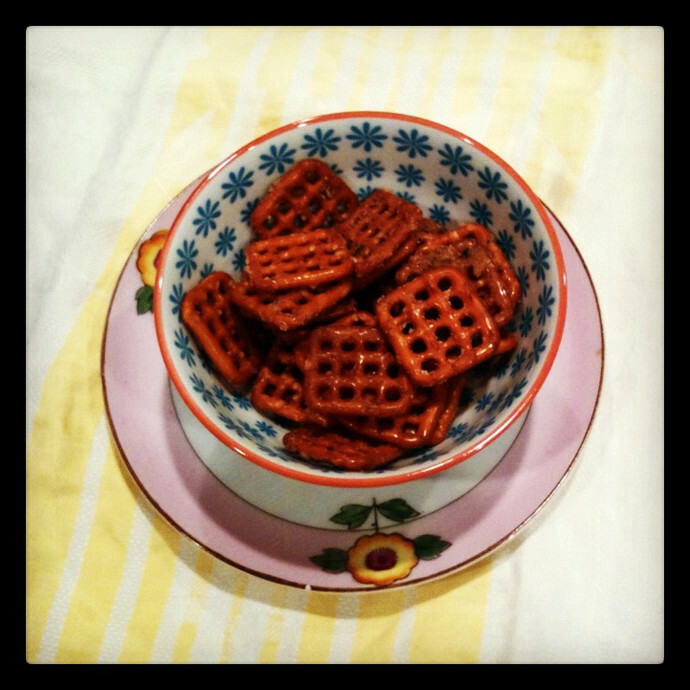 I gave you these pretzels so you'll give me consult on the "issue" below. I realize this is totally a not-real-life-issue-and-doesn't-even-matter-but-I-don't-know-what-to-do problem (and need to use some more hyphens): Christmas stockings. What do you do for your first kid? Our stockings (me, Jonathan, and Red the Cat's) are classic ticking stripe from Pottery Barn, which I picked several years ago knowing that they'd have the same, if not coordinating stockings at PB forever and ever. Alert: the 2011 Pottery Barn holiday catalog is not complete with ye classic ticking stripe Christmas stockings. There are of course, the solid red with white tops and the red/green ones, as well as some tapestry-looking ones with a snow man and a tree maybe. The question is this: what in the heck do people do? Are you supposed to buy multiple stockings for how many kids you want to have from the get-go? Because that is SO MUCH PRESSURE to let Christmas stockings decide how many children you have (obvi). Or should I just [pretend to] play it cool, wait and then hope they'll have the matching one whenever that time comes? Or, go for mismatched kids' stockings and be all easy-going and "eclectic" (such a hot word right now)? Does anyone else think about this? I don't know if I am qualified to respond, as I only have one child (and may remain this way forever). Daniel and I have matching ones from PB outlet. The red/velvet one. We have the matching tree skirt. 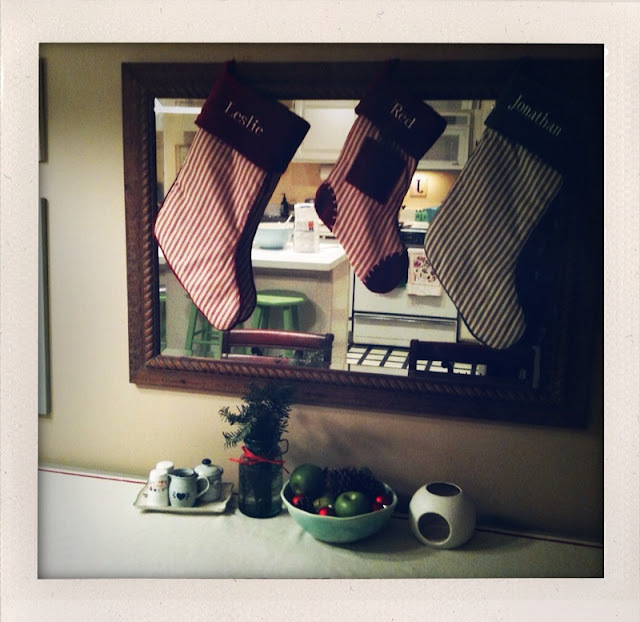 We have small stockings (like the size of Red's stocking). I don't know! Maybe you could buy a several different ones, for children. This way, you'll have kiddo stockings that match and parent stockings that match. This way you don't have to start all over, nor wait and hope for the matching ones to pop up. Check out the outlet for your stripe ones. Maybe they'll be there? My .02 cents. Good luck and don't stress about it! Keep your eyes open for something you love and go for it. I say have parent matching and kid matching stockings. Eclectic gets my vote. We had mismatched stockings growing up. I liked knowing which one was "mine". It had a pin on it of a mouse wearing a Christmas hat and carrying a candy cane. Though I vote eclectic, I'm making stockings this year. Fur stockings. I'm kind of excited about it. I have also considered this and I do not even have kids (yet). I will share you what my mom had done my entire life- and I love it. I have the cutest stocking that my mom still uses and has my entire life with my name on it and a santa clause sewn on it. My brother has one made just like it but with a reindeer on it(I think?) and his name on it. So whatever stocking you end up with, I think you should use it for your child their entire life. I'm all for buying stuff ahead in anticipation for the next kid. We bought a pink and a blue mini Christmas tree a few years back knowing we'd have one or the other some day, and Lainey already had a pink one. All that rambling to say whatever you decide will be just fine!